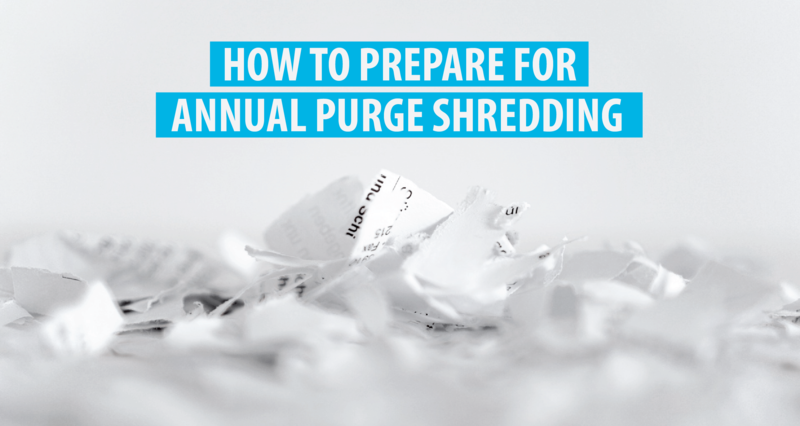 ﻿ Tips to Help You Prep for Bulk Purge Shredding - Augusta Data Storage, Inc.
It’s hard to believe another year is coming to a close. For many businesses, the end of the year also represents an opportunity to plan and prepare for the coming year and to tidy up some of those lingering tasks. One of the most common year-end tasks for Augusta area businesses is planning and preparing for record purges. Annual record purging can help to eliminate risk of old and outdated files being lost or misplaced and helps to ensure you remain in compliance with federal and industry-specific privacy and retention requirements. It’s important to know your state, federal, and industry specific retention requirements for different types of records. It’s best to have these noted as a part of your retention policy to keep everyone up-to-date on compliance standards. If you are preparing a retention policy for the first time, you can review some of our tips here. Once you have reviewed your purge requirements and you have an idea about how many records should be purged and securely destroyed, schedule your purge with a local vendor. Augusta Data Storage offers mobile or plant-based purge shredding as a part of our NAID AAA Certified operation. Once you know which records will stay and which will go, separate the records for destruction and clearly label them so they are not misplaced. If you are pre-sorting prior to your scheduled purge date, we recommend storing your files in a secure location to avoid any additional security threats once they have been removed from storage. For many vendors, it’s important to make sure that no items end up in the shred bin that shouldn’t. At Augusta Data Storage we request that all items be removed from binders and large binder clips before placing into shred bins. Paperclips and staples can be processed. For more tips on prepping your files for shredding, check out our past blog post. If you have scheduled service with Augusta Data Storage, on the day of your purge we will arrive to either pack up your records boxes for transport to our plant-based shredder, or we will arrive on-site with one of our secure mobile shredding units to perform the job at your facility. Once your records are purged you will receive a certificate of destruction for your records stating what was destroyed and when. What Records Should Be Securely Destroyed? It’s best to err on the side of caution when it comes to secure destruction of documents. If you aren’t sure whether a document should be shredded or not, shred it! It’s better to be safe than sorry. Here are a few examples of the types of records that often require secure destruction and have specific retention requirements. If your business or organization is preparing for your annual records purge contact Augusta Data Storage. We are committed to helping you securely destroy your records as quickly and easily as possible.